When giving a presentation or creating a report for work, school or business, you'll always want to deliver the highest quality. 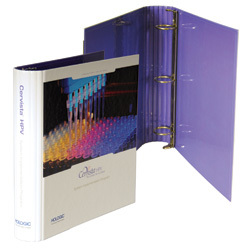 One way to really stand out from the rest is with a Turned Edge Binder from PackZen. Our Turned Edge Binders feature a glued smooth edge, just like what you would get with a hand crafted book, but in the form of a beautifully built ring binder. We offer these binders with a large variety of cover materials which include different types of plastic, paper, real and also imitation leather, and even cloth. We can offer you also a selection of different options for the spine hinges which which offers outstanding performance for many years. These beautifully made binders will feel right at home in any boardroom or other professional office setting. They can be easily customized with options such as foil stamps, debossing, screen printing, embossing or even applied film laminate. We can assist with artwork and design so that your binders give you that professional edge you're looking for. These Turned Edge Binders are best for your reports and presentation materials. They are professional and will impress with their high quality. Both the style and the size of the binders are customizable.